Not all the time, but at least at this time of year. 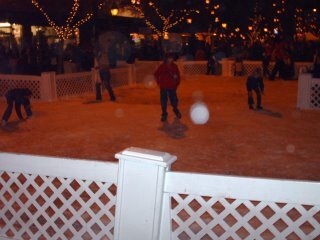 Last night, my husband and I went to downtown Glendale to see the final night of lights and glitz. 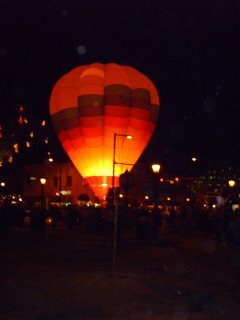 The great finale included glowing hot air balloons, imported snow for the kidletts and horse and buggy rides for the romantic. Now let’s review. In case you are a newcomer to this blog, I am a chocoholic—not a recovering one either. No, I here and now admit, my name is Jenny and I am an active and current chocoholic. So, my husband wasn’t the least bit surprised at my remark. However, I was. When I say something and have no idea where the thought came from, I must analyze. And I realized from the start, the whole evening was a chocolate covered presentation. What began years ago as a small town event in the midst of one of the biggest metropolises (is that a word?) in the country, had to have some sweet coating. The original idea was to bring community together and build on a safe family environment. Yet, when you scratch the coating away it is revealing. Parking has become such a chore cars circle the area for near to thirty minutes hunting for a space within a mile of the festivities. And sadly, the older structures where the latecomers leave their cars aren’t exactly what the historic preservation society had in mind for Old Town. Only blocks from the fun, some of the poorest of our state try to find shelter. And, of course, what would chocolate be without nuts? The revelers may be families but small town America is learning new definitions of the word. However, I don’t think so much has really changed. We’ve always put the white wash (white chocolate?) over what we don’t want to acknowledge. We have chocolate covered elephants in the room, I mean park. Is this bad? Well, when it comes to a matter of faith, I don’t want to bite into a candy only to find some filling I would rather trash than eat. But, there are times when a spoonful of sugar—or chocolate—makes the rough days easier to get through. I’ll bet you can tell where I’m going with this. Yep, back to that blessing thing again. The unexpected hug from a kidlett you wanted to give to the coyotes that melts your heart, or the email that makes you laugh after a day you wanted to cry through, or just knowing your Abba is walking down this sometimes glitzy and sometimes spooky road with you are certainly ways of coating your day in a chocolate hug. And when we accept that person who looks a little different or help that family struggling just to stay together, we help pour a chocolate sweetness on what otherwise may be a hurtful day or existence. You may be the only delicious thing they will experience. But it may be just what they need to point them to the Source of all goodness. I thought of saving this for Valentine’s Day but when it’s on my heart, it is time. Besides, the Chocolate Festival will be hitting Glendale in a few weeks. I can do a reprise then. So, until next time, I wish you abundant blessings and chocolate covered days. Okay, we've got to hit the chocolate festival together. I've never been. 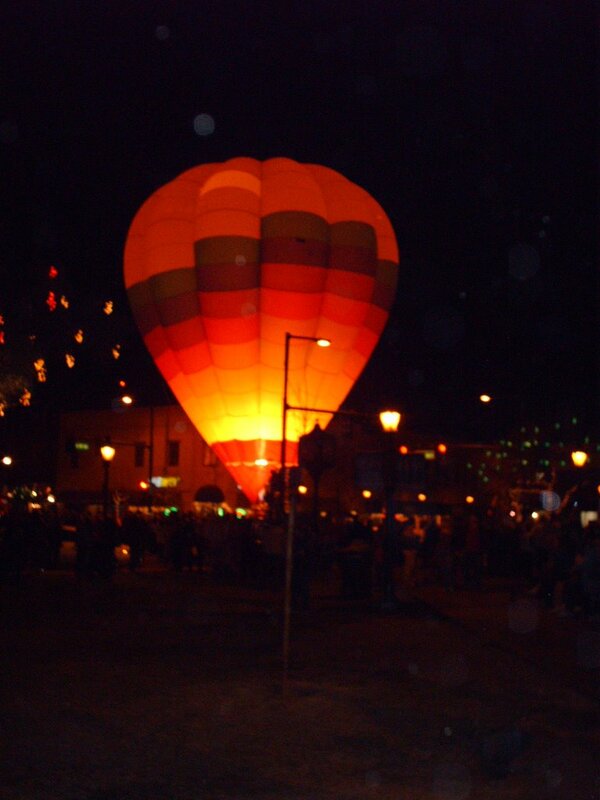 Great pic of the hot air balloon. I've been seeing them a lot in the sky to the south lately. Must be because we've had absolutely no wind until today. Oh and I guess something for Phil too since the poor thing can't eat it. Shoot me if I ever get to the point I can't have chocolate, okay? Sound like a plan-the three "Musketeer-ettes" can hit the festival. I don't remember if they do the balloons again at the chocolate festival or not but they have chocolate pizzas you get to make yourself. And, though Phil maybe should stay away from chocolate due to the sugar, he has been known to indulge in small amounts. Speaking of which, I need to get another chocolate fix, so later, dudettes! Um, the chocolate pizza comment was supposed to be from me. Sorry, I was wearing my Jenny mask. An upscale festival of chocolate and romance, gourmet cuisine and beverages, horse-drawn carriage rides, national entertainment and tours of Cerreta Candy Company all in Historic Downtown Glendale. Time: Friday, 5 to 9 p.m.; Saturday, 10 a.m. to 9 p.m.; Sunday, 10 a.m. to 5 p.m.
OOOOOOOOH sure... I click on a new blog and they tease me with Chocolate.... I have been battling the M & M craze for a week now... Last night I had to sit in a lobby for 2 hours next to a snack machine with m & m's staring at me! Now a festival of chocolate?..